In the title of this post I used the spelling given in the pattern book for this style of doily. I have seen it spelled a few different ways. 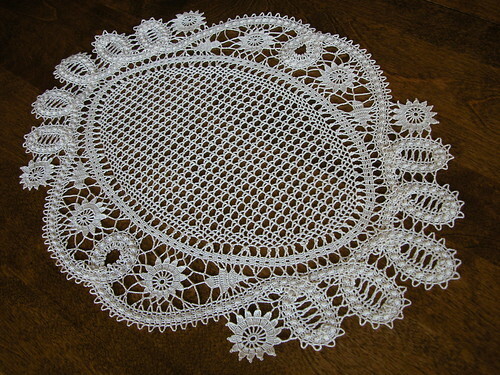 This doily measures 18″ by 13″ and makes a nice table-center. The center is traditional lacet stitch with a border of filet squares. I made this several years ago when I was doing lots of this type of work. I can not find where I joined the ends of the tapes together. I remember I developed a way to do an invisible join in crochet, requiring the removal of the first chain row. Then on the last row removing the crochet hook from the work and pulling the stitch through the now loose bottom loops of the stitches as required. It is also a great way to fix old crochet doilies that have a hole in them. Note that the flowers are crocheted off center, like viewing real flowers. That is what I love about this stunning design. This entry was posted on Wednesday, October 29th, 2008 at 7:47 am and is filed under Crochet and Lace. Tagged: Crochet, Doily, Lace, Thread. You can feed this entry. You can leave a response, or trackback from your own site.